In an age of Amazon and Whole Foods mergers, it is not hard to imagine fresh foods being delivered closer and closer to home, wherever that may be. And while the “local” food moniker is getting as much or more attention than “organic” in terms of consumer affinity, the reality is that much of our food supply is necessarily quite far afield. So, how do we satisfy the competing requirements of high quality, low cost and sustainability of what we eat? One area of increasing focus is energy efficiency in the cold chain. Energy for large scale refrigeration is often the largest cost line item for food and wine that needs to be shipped all over the world. Fresh vegetables, for example, are picked in the field and moved to processing plants, where cooling from field temperature to 34 degrees is the first order of business. And very energy intensive. The “cut-to-cool time,” to which it’s referred, is ideally two hours or less from harvest to handling. Processing plants are where the cold chain starts and fresh produce is extremely sensitive to timing. From an energy perspective, cut-to-cool time presents a particularly arduous situation given fields are often several hours away from the processing facility and the product must be cooled almost immediately after it arrives. The result is a spiky electric power load that varies daily, weekly and seasonally. Most facility owners these days have implemented baseline energy efficiency measures such as LED lighting, insulation, upgraded dock doors and advanced motors and controls. Rooftops are often maxed out with solar as well. However, processors are finding these efforts only get them part of the way there because of this spiky seasonal load. 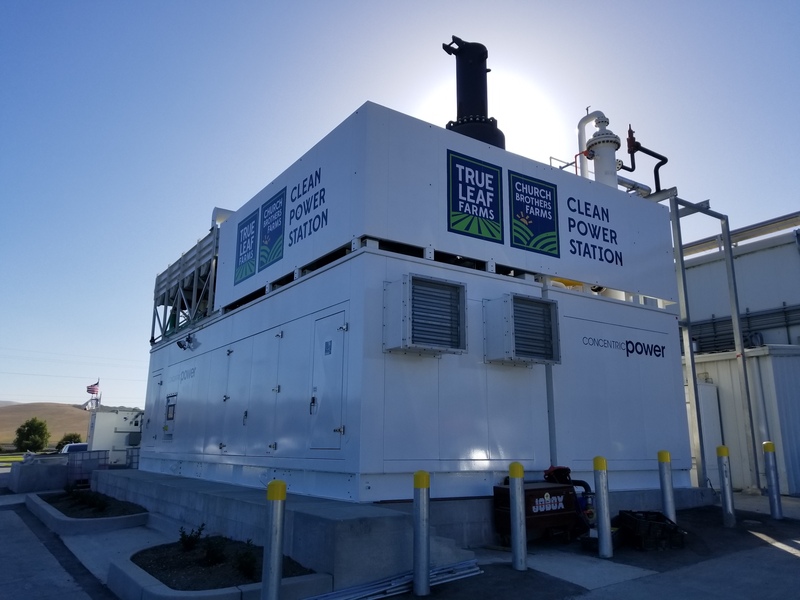 Salinas, CA-based Taylor Farms is addressing the problem with an onsite power plant that provides both electricity and low temperature refrigeration, known as cogeneration or cogen. But this is not your father’s cogen plant. The system was designed and installed by Concentric Power as part of their modular product system. Modern controls and engine performance allow sites to get nearly entirely off the grid. Taylor’s Gonzales, CA facility employs wind, solar and cogen to optimize for economics and sustainability. Wind produces 16% of the load, solar 10% and cogen 64%. Concentric Power is a leading player in the space having developed advanced control algorithms specifically for cold chain applications. Concentric modules are able to load follow and optimize in real time. The software platform also lends itself to rolling out networks of units throughout a supply chain. Cold storage facilities further down the cold chain with flatter energy curves are also a good fit. Individual plants are able to take advantage of the greater network. In a way, it is the Internet of Things on an infrastructure scale. From a mechanical engineering perspective, Concentric takes advantage of the engine heat to drive a low temperature aqueous ammonia absorption process. The modular system ties directly into existing ammonia refrigeration systems with two simple piping tie-ins to provide base load refrigeration while the engine load follows. The end result is a greater than 25 percent reduction in both greenhouse gas emissions and up to 50 percent reduction in energy costs, all while supporting the key metric cut-to-cool time. Despite the higher visibility of the last mile of the cold chain as seen by the general public at the grocery store, restaurant or online retailer, it is often the first mile way back at the farm that can have the biggest impact.